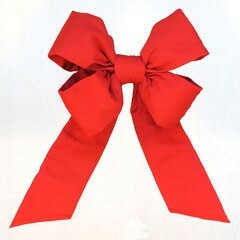 SHOWN IS OUR 24" PREMIUM OUTDURA RED BOW. STANDARD 4-LOOP DESIGN. Our Outdura line is the strongest of the fabrics. If you are looking for a product that will last, this is the top contender. Our Outdura marine acrylic fabric provides the best UV protection; you can expect 6 to 7 years or more of use with this great bow.